The 58 delegates and observers who gathered in Salinitas, Sonsonate, El Salvador for the 17th General Assembly of IARU Region 2 experienced a busy and enjoyable week. The conference began on October 4 and concluded on October 8. Twelve IARU Member-Societies in the Americas were represented in person, with another seven represented by proxy. President Kay Craigie, N3KN, served as the voting delegate for the ARRL and was assisted by International Affairs Vice President Jay Bellows, K0QB, and Executive Vice President David Sumner, K1ZZ. Observers from IARU Regions 1 and 3 and the International Secretariat were present to assist and to learn from the conferees. Read more here. At its January 2010 meeting, the ARRL Board of Directors decided to make the agendas of Board and Executive Committee meetings available on the ARRL Web site. The agenda for the October 23 meeting of the Executive Committee is now available. 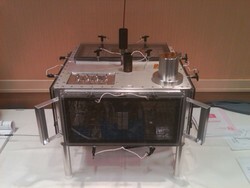 The development and next year's scheduled launch of ARISSat-1 were the main topics of discussion at the 2010 AMSAT-NA Space Symposium and Annual Meeting, held October 8-10, 2010, in Elk Grove, Illinois. ARISSat-1 has been delivered to NASA to undergo final preparations for delivery to the International Space Station. ARISSat-1 is scheduled to be manually released into orbit during an ISS spacewalk early next year. The ARISSat-1 project began when plans for SuitSat-2 had to be shelved for lack of a space suit. The development team undertook the task of housing the payload planned for SuitSat-2 in a more traditional housing adapted for manual deployment. A few units were developed to have on standby for future launch opportunities; one of these units was on display at the Symposium. Read more here. The Fifth Annual ARRL On-Line Auction opened for bidding at 10 AM (EDT) on Wednesday, October 20. According to Business Services Manager and ARRL On-Line Auction Coordinator Deb Jahnke, K1DAJ, there is a large assortment of ARRL Product Review items, donated new and vintage equipment, rare books, one-of-a-kind items and more. "If readers are interested in some great bargains and some great fun, you really need to check this out," she said. She expressed gratitude to the ARRL Business Partners and individual donors who have contributed items to this event. The 2010 ARRL On-Line Auction runs through 11:59 PM (EDT) October 25, 2010. The second edition of Spectrum Defense Matters -- a newsletter aimed at keeping ARRL members updated on issues related to the protection of Amateur Radio frequencies -- has just been released on the ARRL Web site. This newsletter covers both domestic and international topics related to the Amateur Radio spectrum. Your financial support is vital to continue the ARRL's work to protect your operating privileges. You can do this by contributing generously to the ARRL Spectrum Defense Fund. "We are facing very real and immediate challenges [to the amateur spectrum]," said ARRL Chief Executive Officer David Sumner, K1ZZ. "Over the past couple of months, we have addressed FCC spectrum management issues affecting our 430 MHz and 2.3 GHz bands, as well as interference from unlicensed stations operating in the lower part of 10 meters." But Sumner said that opportunities lurk among the challenges: "A possible new amateur band just below the AM broadcast band is on the agenda of the 2012 World Radiocommunication Conference. We face significant hurdles in getting what would be at best a secondary allocation, but we're working hard to persuade the radio services in this part of the spectrum that an amateur allocation is compatible with their future requirements. We recently gained crucial support [for this allocation] in the United States." Sumner said that it takes what he called "a concerted global effort to protect Amateur Radio's access to the radio spectrum and guard against interference that reduces our ability to communicate." You can take an important step right now to support ARRL's commitment to defending the Amateur Radio Spectrum. According to ARRL Chief Development Officer Mary Hobart, K1MMH, the ARRL is almost $194,000 shy of its Spectrum Defense Fund goal of raising $325,000 by the December 31 deadline. "Please make a generous contribution to the Spectrum Defense Fund by mail, on the Web or by phone," she said. "Perhaps you'll consider a very easy way to contribute by pledging $10 or $20 or $100 a month. Your financial commitment, over and above your annual dues, will ensure that ARRL has the resources to represent you and protect your operating frequencies." To make a donation via mail, please send to Spectrum Defense Fund, ARRL, 225 Main St, Newington, CT 06111. To make a contribution over the phone, or to discuss other giving options, please call 860-594-0397. Read more here. The ARRL is pleased to welcome Instruction and Resource Coordinator Dewey Rykard II, KI4RGD, to the Headquarters staff in Newington. Rykard, who will be working in the League's Education Services Department, will focus on developing and identifying resources for ARRL instructors. He also will play an integral role in the annual series of Teachers Institutes in Wireless Technology, sponsored by the ARRL and held every spring and summer around the country. In his position at ARRL HQ, Rykard will be assisting Education Services Manager Debra Johnson, K1DMJ. His responsibilities will include reviewing and organizing resources needed by instructors, teachers and Scout leaders, developing lesson plans to be utilized by ARRL Registered Instructors and for the ARRL's Education & Technology Program (ETP), providing guidance in the development of ARRL license study manuals and coordinating the ARRL's educational award program. In addition, Rykard will provide support for the ETP, participate in the Teachers Institute trainings, help to provide ongoing resource support for teachers and assist with administration of the ETP. You may meet him at the ARRL booth at conventions where he will represent ARRL Education Services programs. Read more here. The Sun, as seen on Thursday, October 20, 2010 from NASA's SOHO Extreme Ultraviolet Imaging Telescope. This MDI (Michelson Doppler Imager) image was taken in the continuum near the Ni I 6768 Angstrom line. The most prominent features are the sunspots. This is very much how the Sun looks in the visible range of the spectrum. Tad "The Sun is up, the sky is blue; it's beautiful and so are you" Cook, K7RA, reports: The average sunspot numbers for the week were up nearly 44 points to 55.6, but the average solar flux readings were unchanged, at 84.9. A few days ago, the solar flux values rose above 90, but currently the projection from USAF and NOAA for solar flux over October 21-31 is 84, 83, 82, 82, 82, 80, 78, 80, 85, 80 and 80. Seven new sunspot groups arrived since October 9: group 1112 came on October 9; group 1113 on October 13; 1114 and 1115 on October 14; 1116 on October 17, and 1117 and 1118 on October 19. While the average sunspot number for the past week was 55.6, the greatest sunspot activity was over the past few days, with the daily sunspot numbers on October 17-20 at 61, 69, 65 and 61. Look for more information on the ARRL Web site on Friday, October 22. For more information concerning radio propagation, visit the ARRL Technical Information Service Propagation page. This week's "Tad Cookism" is brought to you by John Lennon's Dear Prudence.